Welcome to Mentor for Bank Exams. 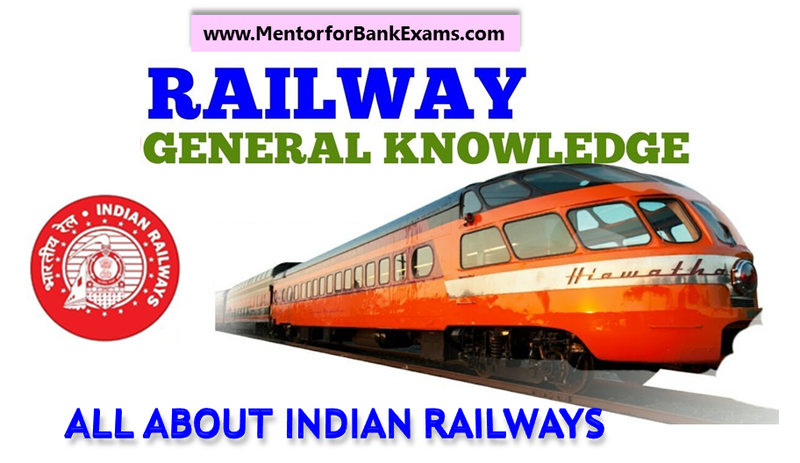 Here we today updating the 25 questions of Indian Railways previous examinations Q.A with there answers. We hope after read each of these very important questions answers your knowledge about the Indian Railway will be increase very high and these all questions are highly important and must be read for preparations in next upcoming railways exams 2018. 26) Which is the Indian railway zone with the minimum length? 27) The headquarters of South Railways is situated at where? 28) How many training institutions of Railways are in India? 29) On which year the first train in India was started? 30) In which Governor-General’s reign railway lines in India were established? 31) In which institution the training of electric work is being given? 32) What is the position of the Indian Railway in the world according to the length of rail lines? 33) Who invented the railway engine first? 34) Where is the Indian Railways Institute of Mechanical and Electrical Engineering Institute situated? 35) Metro Railway is functioning in which of the following Indian States? 36) Where is the Indian Railways Institute of Civil Engineering Institute situated? 37) Which of the gauges is used in the hilly areas? 38) How many institutions do give suggestions for railways technology? 39) Palace On Wheels train was inaugurated in which year? 40) The passenger bogies of the Indian Railways are manufactured at which of the following places? 41) Rajasthan is under which of the following railway zones? 42) Indian Railways which is the largest of the Public Sector Enterprises, is divided in how many regions? 43) Besides Maharashtra, Karnataka and Goa, which of the following is the fourth State for Konkan Railway Project? 44) When was the Jammu City appeared on the map of Indian Railway? 45) When was the Central Railway established? 46) The manufacturing of steam engine in Chittranjan Locomotive Works was stopped in? 47) The largest national enterprise of India is? 48) The first locomotive which was manufactured in Chittaranjan on? 49) Where is the wheel and axle plant of Indian Railways situated? 50) Where is the extreme north railway station in India?